These charms are made from an exquisite metal. They are perfect accessories for your dog or cat collars and can also be used to accessorize keychains. 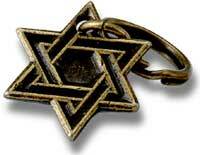 This charm depicts the Star of David. Approximately 3/4 in. x 3/4 in. (1.9 cm x 1.9 cm) not including the attached keyring. Golden colour with black enamel. Perfect for Jewish dogs or cats.